Product: This is a DB standard design 23 meter / 74 foot 9 inch turntable. It is designed for conventional and digital locomotive operation. The remote controlled deck has a built-in motor. It can only be controlled digitally with the Mobile Station 2 and Central-Station 2 and 3 (not included). Control with the Central-Station 2 and 3 is especially easy by means of track indexing (after carrying out an update), or with different digital central controllers that use the DCC digital format. Function: The deck turns right/left and the pit is designed for sunken installation in the layout. 6 track spoke connections for C Track are included for insertion at the location of your choice. The spoke angles are in the C Track grid spacing of 12°. The turntable can used with K Track by means of the 24922 adapter track and with M Track by means of the 24951 adapter track. A maximum of 30 track spoke connections in the spacing of 12° can be done with the 74871 expansion set. Locomotive operating current is supplied to the track spoke connections by means of the turntable deck. The external diameter of the turntable with one each spoke track opposite each other is 382 mm / 15-1/32". The diameter of the pit without spoke tracks is 278 mm / 10-15/16". The deck length is 263 mm / 10-3/8". 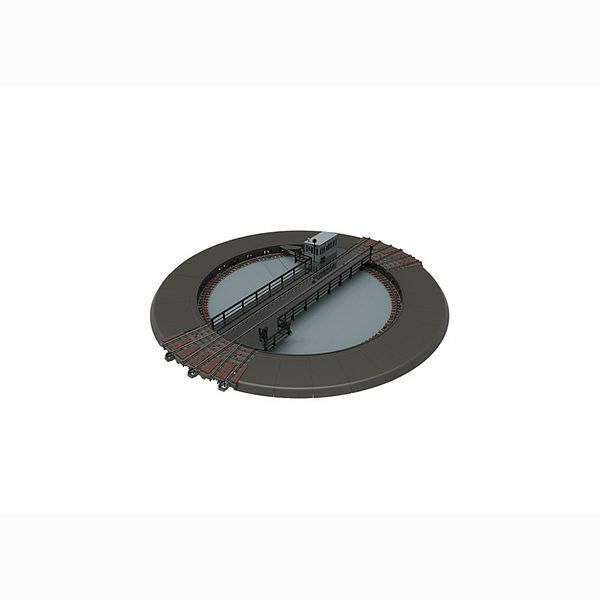 This turntable can be used with the 72886 roundhouse locomotive shed. Various sound functions can be controlled. LEDs are used to light the turntable operator's hut and the outside lighting and they can be controlled. Operator's hut with LED lighting.